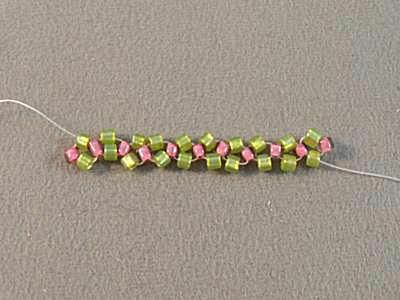 This beading stitch tutorial teaches you how to do tubular right angle weave. The tubular right angle weave makes a soft and supple beaded rope that can be used to show off a beautiful slide or used as a beaded necklace all by itself. To begin tubular right angle weave, first, make a strip of right-angle weave as you normally would. If you are using a dowel or pencil to hold your beadwork, check the fit of the strip by wrapping it around the dowel. The ends should just touch - make sure that the strip is not too loose. To connect the ends of the strip, pick up a bead and pass through the side bead (or wall bead, illustrated as a blue bead) of the very first unit you stitched. Pick up the​ second bead and pass through the side bead of the very last unit you stitched. Pull snugly. With the addition of this unit, your strip of right angle weave will form a ring. To begin a new row in tubular right angle weave, pick up three beads and pass through the bead you were exiting at the beginning of this step. This will form the first unit of the row. To get into position to continue stitching, pass the needle through the next side bead (or wall bead), illustrated by the blue beads. Stitch the row in single needle right angle weave as you normally would. When you reach the end of the row, there will be a unit that requires just one bead on the top (or ceiling) to complete it. With your thread exiting one of the side (or wall) beads, pick up a bead and pass through the next side bead. Pass through the remaining beads in the unit until you are exiting the top (ceiling) bead of the unit you just completed. You are now in position and ready to begin the next row by adding a unit of beads as illustrated in Step 3.